D.J. 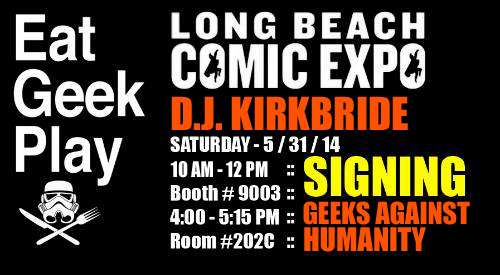 sneak attack at LONG BEACH COMIC EXPO on Saturday! Posted on May 30, 2014 by D.J. I couldn’t get a table, so I sneaking in thanks to the Eat/Geek/Play‘s Kevin Knight, who I appreciate so much I make sure to spell his name correctly! I’ll be at their table from 10am to 12pm selling and signing copies of AMELIA COLE AND THE HIDDEN WAR and NEVER ENDING — plus I have a few AMELIA COLE T-Shirts left in stock! Then at 4 it’s off to their epic “Geeks Against Humanity” game! Should be something!